A week after its unveiling at a special event in New York City, Apple's hotly anticipated iPad Pro lineup is on sale around the world. We pit the 11-inch variant of the all-screen tablet against last year's 10.5-inch model, comparing design, performance and utility. Setting up Face ID on the 2018 iPad Pro. The new iPad Pro feels incredibly thin in the hands. Compared to last year's 10.5-inch iPad Pro, the size and weight difference is immediately apparent, with the 2018 model's squared off the edges providing a slim but sturdy feel. The Space Gray model looks brilliant with a dark contrasting antenna line at the top and the repositioned Smart Connector near the bottom. Interestingly, the three-contact communications interface is no longer color matched to iPad Pro's body and instead sports a polished silver sheen. iPad Pro camera bumps compared. Opposite the Smart Connector on iPad's back side is the notorious camera bump. It sticks out a bit more than the unit on the 10.5-inch iPad Pro, and it's also a lot wider as well, but we feel the addition adds to Apple's industrial design. It should be noted that Apple is borrowing the camera from its new iPhone XS, stripping out optical image stabilization and adding a couple of minor changes to make it work for iPad users. On the side is a dark plastic piece that serves as a window for Apple Pencil's inductive charging components. This year, Pencil snaps onto iPad via a series of magnets and charges wirelessly, a step up from the cumbersome -- and potentially dangerous -- Lightning connector solution introduced with the first-generation stylus. Also on the side, new volume buttons feel more flush with iPad's chassis as compared to the pushers on last years' iPad Pro. As usual, they feel nice and tactile. The power button operates the same way, but outside it feels different because the sides are now flat, not tapered like before. We also have four speakers, two on top and two on the bottom of the iPad Pro, and there's now 13 speaker holes in each grille instead of 11 on the 10.5-inch model. Two microphones are located on the top of the device and the new USB-C connector is on the bottom. The headphone jack is now gone, but Apple does sell a $9 USB-C to headphone jack adapter online. View of speakers and camera bump. On the topic of connectors, Apple now includes a new 18W USB-C power adapter in the box, which is superior to the old 12W adapter that came with previous iPads. Now looking at the displays, the new edge-to-edge screen on the 11-inch iPad Pro is obviously the star of the show. With no home button and an integrated front-facing camera, Apple was able to substantially slim down the bezels. Interestingly, the chassis on the 11-inch model is actually a bit wider in comparison to its predecessor, as the 10.5" iPad Pro has thinner bezels on its sides. Replacing Touch ID is TrueDepth and Face ID, which on iPad Pro works in both portrait and landscape orientations. We ran Geekbench 4's CPU benchmark on both iPad Pros to see just how much more performance the new model's A12X Bionic chip offers over the A10X Fusion SoC. The 2017 10.5-inch iPad Pro scored 3,985 in single-core and 9,564 in multi-core, decent numbers for a mobile processor but nothing compared to the 5,017 single-core and 17,784 multi-core scores achieved by the new iPad Pro. Testing Geekbench 4's graphics test, the 10.5-inch iPad Pro scored 29,934 points compared to the new iPad Pro's 42,219 points. That's not quite the doubling of performance that Apple claimed in its keynote, but a 41 percent improvement isn't a small jump. Maxing out the brightness on both the 2017 and 2018 iPad Pros, we navigated to Amazon's homepage. With True Tone on, we noticed that the new iPad Pro's display is actually quite a bit warmer. We turned the feature off and witnessed the same results -- the new iPad Pro's display is warmer compared to the old iPad Pro. iPad Pro with True Tone enabled. We also noticed that the corners of the new display were darker than the center on the screen, probably due to pixel masking and other engineering effects applied to the curved corners. The new 11-inch iPad Pro's speakers are just as loud as before and we did not perceive any improvements in fidelity. However, we noticed a substantial improvement in bass reproduction. The new iPad Pro has punchier and deeper bass than its predecessor. Like the revamped iPad Pro, the new Apple Pencil feels nice in the hand. Instead of using a glossy chassis, Apple went with a matte finish that is not as slippery. One side of Pencil is flat, both for ergonomics and magnetically connecting to the iPad Pro. Comparing it to the original Apple Pencil, the new version is actually a bit shorter and it seems to be lighter as well. The magnets connecting Apple Pencil to the iPad Pro are very powerful. Coded magnets attract each other and repel others to force Pencil into proper alignment for charging, even if you try to intentionally offset its placement. Upon first contact, iPad Pro asks to pair the Apple Pencil, which is accomplished with a single tap. A popup allows users to explore the new double tap feature that enables quick switching between app tools. For example, a double tap in the Notes app toggles between pencil and eraser input. Apple designed the control scheme to be configurable, so third-party apps will be able to implement their own unique Pencil settings. Placing the iPad Pro the new Smart Keyboard Folio is a breeze thanks to iPad's internal magnet array. The bond is very strong. We even hung the iPad Pro from the keyboard and shook it -- it didn't budge. We love the design because there's nothing going around the edge that has to physically lock onto the iPad Pro to hold it in, so three of the four sides are exposed. With the year's Smart Keyboard Folio, the back of the iPad Pro is covered and protected as well, and it honestly still feels very slim. The camera bump is completely covered and protected as well. With the Smart Keyboard Folio on, users can still attach an Apple Pencil for charging and carrying. Opening up the Smart Keyboard provides two different typing angles, one being close to vertical and another that lays down a bit more for laptop work. The keys are nearly identical to the older design and are still small and difficult to type on compared to a MacBook keyboard. Adorama, an Apple authorized reseller, offers a variety of perks on iPad Pro purchases, including no sales tax on orders shipped outside New York and New Jersey and free shipping within the contiguous U.S. Shoppers can also take advantage of financing incentives with the Adorama Credit Card, such as no interest when paid in full within six months on iPad Pro orders over $500 -- or no interest when paid in full within 12 months on iPad Pros over $1,000. With the holidays fast approaching, having a little extra time to pay off the purchase can be beneficial. Backorders are filled on a first come, first served basis, so you'll want to reserve your spot in line today for the fastest availability. Adorama will not charge your credit card until your order is ready to ship. For deals across all iPad lines, including dicounts on 10.5-inch models, be sure to check out our iPad Price Guide. *Adorama will not collect sales tax on orders shipped outside NY & NJ*. iPad Pro qualifies for no interest when paid in full within 6 months on purchases $500-$999, or no interest when paid in full within 12 months on $1,000+, with the Adorama Credit Card. I’m using my new iPad Pro now and I’m surprised over how no one is mentioning that with the lack of home button, the auto layout and home bar actually make for a shorther screen when used in landscape. Also, until fulllscreen game apps are updated, they don’t make use of the extra width and actually shrink down to make room for the home bar. Some games are essentially unusable compared to the older iPad Pro; PUBG plays with native screen resolution and beautiful graphics at 60Hz or greater on the old IPad, whereas this new one is forced to one of the lowest graphics settings and scaled down resolution. It’s really bad. Temporary, but bad. As you say, it's a temporary situation -- so maybe that's why nobody but you thinks its very significant. I was in the store today and although I like the overall feel of the new 11” iPad, i disagree entirely— it feels thicker than past iPads, especially my iPad Pro 9.7.” Perhaps the 10.5 got a bit thicker with the redesign, but compared to the old design of the 9.7 iPad Pro and iPad Air 2, this does indeed feel thicker without the tapered edges. The Smart Keyboard is INCREDIBLY well engineered this year. It’s sturdy as hell. But again, with the keyboard attached and folded— this year’s iPad feels significantly thicker than the 9.7” with Smart Keyboard. I hope this clarifies for those who care about what the actual design is like, because I find this article draws erroneous conclusions. Let me be clear— I like the new design, I think there’s something magical (Magnetic? Pun intended) about holding it. But it does not feel thinner. Unrelated question: when will Appleinsider's commenting system work properly with Safari on iPad or iPhone ? Similarly for the thickness. The new 11" model is just one hundredth of an inch thinner (0.4mm) than the 10.5" version it replaces. Anyone for whom that's significant has a new career before them as a human micrometer. Are you referring to the comment box not enabling and giving you the insertion cursor when you touch in the box? A workaround for this is to touch in the extreme upper left hand part of the box, where the first character will be inserted. Yeah, this is an annoyance but hopefully the people who maintain the site will fix it soon. I just wish they'd support Unicode properly so when you add an emoji, and then edit your post you don't have to also re-add the emoji again or have it show up as a character from some Asiatic language. Still holding out for an iPad Mini Pro! Funny you mentioned that because I also feel the same despite being thinner than all iPads in the past. Having a tapered edge truly gives an illusion that it's thinner than it really is. I also thought MacBook Pro is thicker than old MacBook Air but it said it's thinner. I contribute it to how the edges are created. Yes, and this is why the recent larger iPhones wiil have rounded edges, so those who are wishing for a return to iPhone 4-style squared off edges are just wishing for disappointment. Hey, I just tried that on my iPad here and it worked. Placed the cursor in the upperleft of the quote, typed a character, deleted it, and then placed the cursor at the bottom in the white space where in belongs. Thanks for the tip. Also noticed that if the last character in your post is an emoji, you can’t edit the post again. Worst forum editor I’ve ever seen. Makes CompuServe look state of the art. I want to be able to type a comment — like a very simple WP/rich text instead of having to add HTML for anything other than plaintext. I look at comments I have entered & it reminds me of a Wordstar doc or the slugs in WordPerfect (& using a preview window to view the finished view). 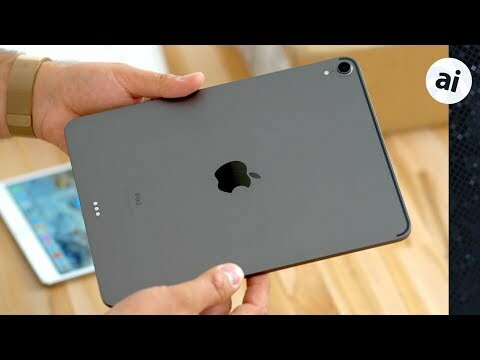 I think that an iPad mini in the same design language will be an awesome device. But I don't think it will be a "Pro" device, i.e., no Pencil support, no smart keyboard / connector, etc. Still, I'd happily buy one. Got mine yesterday. Finished setting it up today. The pencil is definitely worth the upgrade but I’m a little uncertain on the Folio Keyboard. I noticed when I first picked up the box that it seemed heavy. Pulling it out of the box did nothing to change my mind. The new keyboard almost doubles the weight of the combined device. The back is a plasticky rubber cover. It doesn’t look premium for a $200 accessory. The keyboard itself is very similar in feel to the previous generation and the new way that it connects should give a more reliable connection—so that is good. I’m also not too sure about using the iPad Pro when the cover is folded back for use as a tablet. It is pretty thick but the real issue is that the keyboard is exposed so your hand is resting on the keys. The old keyboard design would cover up the keys with the origami case when used as a tablet. Pressing the keys on the Folio when folded doesn’t do anything but it feels odd. I may be able to get used to it. And the final oddity, there is no visible Apple logo when the Folio Keyboard is attached. It covers the logo on the iPad and doesn’t have one itself. This struck me as very odd. The iPad Pro itself seems to be everything advertised and the Pencil 2 is great. A clear upgrade from the original. Edit: I should point out that the article is talking about the 11” and I bought the 12.9” version. Definitely— those tapered edges make a real difference.